Will Hurricane Harvey Spur Houston into an Era of Urban Planning? Looking west toward downtown across the flooded Buffalo Bayou, with Travis Street on the left side of the photo. Photo by Peter Molick. Floodwaters inundated many public areas along Buffalo Bayou and downtown. A month later, crews are still removing the silt and muck deposited throughout the city. Photo by Peter Molick. In late August, Hurricane Harvey camped out over southeast Texas. In some places, it dumped, over the span of a few days, more rain than the historic annual averages. 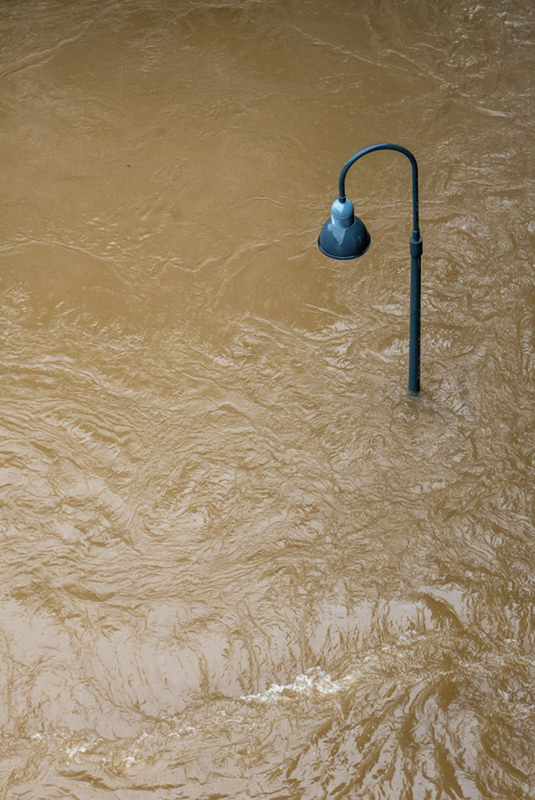 The storm broke the record for rainfall in the contiguous United States. In this brief waterworld, where streets became canals, an army of rescuers arrived to help. City of Houston first responders, the Texas National Guard, the U.S. Coast Guard, the Cajun Navy, and boat owners from across the state converged to pluck people from the waters. The efforts of these brave men and women saved thousands of lives. Harvey was a serious disaster, and as of this writing, 70 people have died from the storm and its aftereffects. But it could have been much worse. With waters now receded and most of the muck torn out of houses, the hard work ahead is to plan for the inevitable next flood event. We’ve heard this “thoughts and prayers” attitude before, as it is pronounced after every major incident, before people return to business as usual. Harvey’s flooding — and prior Houston floods — make us existentially aware of how Houston’s (lack of) urbanism is dangerous. And the response to this flood crisis will set a precedent for how the region solves other big issues. “In a larger sense, it’s a failure to roll up our sleeves and solve the hard problems,” Blackburn says. “The future of all of us is almost dictated by hard choices. We’re facing climate change, and an economy that’s changing. There are a lot of difficult bumps ahead. If we can’t navigate this bump, it doesn’t give people hope about the others.” In short, the way forward determines nothing less than Houston’s long-term existence. A recent count estimates FEMA payouts, via the National Flood Insurance Program, at $11 billion, second in history only to Katrina’s $16 billion cost. But this is misleading, as many homeowners — thinking they were safe, well outside established floodplains — were not carrying flood insurance at the time. Our flood terminology requires renovation: the terms “100-year floodplain” and “500-year floodplain” are simply outdated. But what would the new levels be? What storm should we prepare for? New climates require new safety metrics. For years, Blackburn has said that the 500-year floodplain should replace the 100-year levels as a starting point, until a better standard can be established. This interim metric would mean that about one third of Harris County falls in the updated — though still inadequate — floodplain area, illustrating the systemic nature of the issue. What are other next steps? As a start, Blackburn’s report for Rice’s Baker Institute, which is available online, offers 15 initiatives. At a minimum, new construction should be limited in the new floodplain, and a major buyout program should be instituted for those willing to move to higher ground. (This position was voiced by Rice architecture professor Albert Pope in an op-ed for The Houston Chronicle on September 24.) Imagining this effort brings to mind a phrase from the conceptual artist Robert Montgomery: “All palaces are temporary palaces.” Houston, to avoid becoming a prematurely temporary palace, must address these issues. In addition to the “storm surge” of national editorial commentary on the situation in Houston, local voices have been sounding the alarm in productive ways. The Houston Chronicle has covered the disaster admirably, both in terms of its individual human miracles and its larger existential questions. Cite, the magazine of the Rice Design Alliance, issued an optimistic editorial statement that concluded: “We should be able to look back 30 years from now and say that, out of all the pain and suffering this storm has caused, Houston became a more resilient, beautiful, and equitable region.” (I am a recent addition to the editorial committee that issued that statement.) The publication, in its 35-year history, has consistently addressed flooding: Its first cover was a City of Houston manhole cover, presented with the same gravitas as one would employ to showcase the Aztec Sun Stone. 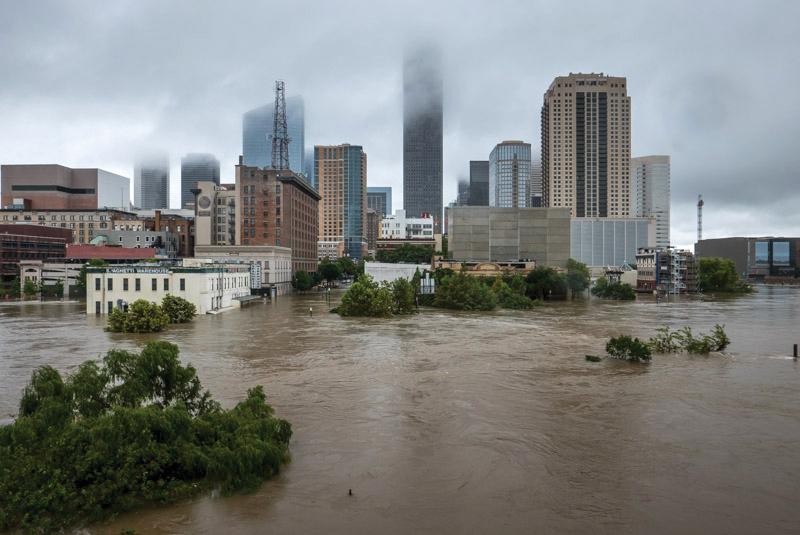 The resources exist to radically remake Houston, but such change requires political will. “If we pick and choose from the best we have in our past, and go forward in a different direction, I think that would tell you a lot about this community,” Blackburn says. “And, frankly, I think Houston has the capacity to do that.” Blackburn considers situations like these to be crucibles, in which change is forged: Harvey was a flood event, but it is also a “change event.” He adds that 20th-century solutions relied too much on engineering and “not enough on a variety of talents and disciplines.” Design and planning at a metropolitan scale is required to accommodate floodwaters. “In the future, we’ll have green-space corridors through the city that are turned over to the water,” Blackburn ventures. Designwise, it would be a very interesting future for Houston, and designers of the built environment — architects, landscape architects, urban planners — are the ones to proactively lead the way. Imagine a new Houston where wide bayou swaths are re-wilded to become the green infrastructural cores of this horizontal city. There could even be golf courses. To Texanize a Dutch saying: God made Texas, but Texans made Houston. The city has built itself up on the muddy banks of the bayous, and this effort at self-realization remains a psychic cornerstone of Houston’s can-do attitude. The city is not afraid to demolish what is deemed past its expiration date, and, historically, has made big plans to build what it wants: freeways, lakes, reservoirs, concretized bayous, ports, refineries, pipelines, hospitals, malls — and the Astrodome. Houston is America’s id, where our material desires are sated in a deregulated landscape of consumption. (If the superego awareness of impending environmental doom is too much to handle, then we’ll need some intervening ego in order to get something done!) Now the chance arrives to use this characteristic survivalist attitude to solve the region’s biggest problem. The solution might not be to jettison the city’s collective impulses, but, instead, to indulge them — becoming in the process not less Houstonian, but more. In early September 1900, a hurricane decimated Galveston, resulting in a natural disaster that remains the deadliest in U.S. history. Afterwards, the city built a sea wall 17 ft tall and 10 miles long, and elevated thousands of homes. What will Houston’s 21st-century response be? The city is known as both “Bayou City” and “Space City.” How about “Bayou Space City?” It has a certain ring to it. If there is to be any Houston left in the centuries to come, this is its future. Jack Murphy, Assoc. AIA, is a regular contributor to Texas Architect and a master of architecture candidate at Rice University. He recently moved to Houston.